Citizen Action Forum (CAF) backed by Namma Bengaluru Foundation (NBF), will question the Akrama Sakrama Bill – 2013 in court shortly. This was revealed in a press conference hosted by NBF on February 5th, 2014. N S Mukunda, President of Citizen Action Forum, who spoke in the press conference, questioned as to why the buyers should be responsible for the mistakes made by the builder. Since the bill has not addressed the core issues of irregularities in the buildings, citizens are forced to go to the court, he added. Later speaking to press persons, Mukunda said that anyone will be able to breach the law, pay the fine and go scot free, with the present rules in Akrama Sakrama. He added that there are provisions in the Karnataka Town and Country Planning Act 1976 to take action against the erring officers, but the Akrama Sakrama rules have no mention of holding officers responsible for their action. “The criteria that violations upto 50% are admissible will make way for corruption. Builder can easily pay the officials to get a certificate saying that the building is within 50% or 25%,” added Mukunda. He also highlighted the problems by innocent buyers who fall prey to the assurances given by builders without knowing the violations made by the builders. “How will a buyer know the nitty gritties of the building? The bill holds the victim responsible for the violation in his building which is inappropriate,” he added. There is already a PIL against the Akrama Sakrama, filed by CAF in 2007, when the bill came out for the first time. Court passed an order to hold the bill and revise it, said Vijayan Menon, member of the Citizen Action Forum, on the sidelines of the press conference. “We will again fight against this builder-friendly bill. An individual’s right to have natural ventilation and light around the building has been taken away by this bill,” he added. “Government every time changes the last date of filing objections, but the rules over all remain the same. Government should forget regularising illegalities and opt for other methods to stop illegal activities forever,” pointed Vijayan Menon. Addressing the press conference, Mahalakshmi Parthasarathy, Director, Namma Bengaluru Foundation, said the government was not being transparent and remained inactive in spite of several attempts to make them accountable. Pointing to the drawbacks in the system, Mahalakshmi said the Ward Committees were established in order to bring in the idea of citizen centric governance, but the idea remains the idea, as Ward Committees remain dysfunctional, and minutes remain unrecorded with the BBMP. BWSSB is completely clueless about the sources of water to meet the city’s water demand. KIADB acquired land under the guise of “public purpose” and catered to private commercial interests in the sensitive Bellandur/ Agara lake wetlands. Government land worth Rs. 76,000 crores (33,878 acres) has been encroached in Bangalore. There are only 184 lakes surviving in Bangalore, many of which are encroached. Public properties are being sold, rented or leased below the market value to vested interests. Example: Sale of Divyashree Chambers, KSCA stadium and many more. Groundwater is non-potable in 110 villages that are now part of the BBMP, due to widespread contamination. BMTF’s inspection brought to light that BBMP spent 8 crores in excess against various payments related to solid waste management. There are no names of responsible officials till date submitted to BMTF. Karnataka ICT Group report was prepared by a small group without public consultation. It proposes an increase in FSI which is dangerous for the city’s health and shows vested interests at play. Mahalakshmi accused the government of closing eyes to issues concerning the citizens, and said the authorities were hand in glove with vested interests to loot public money. Road and infrastructure projects have been granted in violation of KTCP Act under town planning schemes provision, despite opposition from citizens. Government claims that BBMP has spent Rs 17,840 crores on construction and maintenance of city. “Do the roads look like so much money has been spent on repair and maintenance?” she asked. CAF took the Comprehensive Development Plan (CDP) to the court and brought a stay on it. “The draft Master Plan changed its colour in one night. The areas that were declared as reserved for forest turned to be sensitive and then for residential use. This is the reason why, city has unfettered growth,” says Vijayan. At present, the Metropolitan Planning Committee (MPC) is notified; therefore, the planning of 2030 Master Plan should be done by MPC. However, BDA continues to plan without considering MPC, he added. There is a lack of transparency in the land dealings, in the city. Nitin Sheshadri questioned KIADB’s involvement in clearing Mantri Tech Zone projects under the guise of “Public Purpose” for construction of malls and commercial complexes without considering the impact of the project. NBF questioned the government’s act of providing public land to private builders under Public Private Partnership for a meagre amount. The latest example was that of EWS quarters land being given to Maverick Holdings wherein more than 70% of the land would be used for commercial activities. The Sampige Road Metro station has been churned on PPP model with Mantri Developers, who is all set to construct a commercial building and 32 floors residential building right next to the station. This land was originally acquired by KIADB for BMRCL; however, the documents of the land has no mention of KIADB, said T S Vidhyadhar, President, Forward Hebbal. The umbrella body demanded the government to enact a law that could make mandatory for elected representatives and bureaucrats to disclose proxy interests in real estate or in contracting companies that have deals with the government. They also demanded that a white paper on all land and buildings held by KIADB and BBMP indicating revenue and use be available. Referring to Chief Minister Siddaramaiah’s statements on BBMP’s bankruptcy, Ravindranath Guru, Coordinator, Coalition Against Corruption, said the statement isn’t acceptable. “How can the CM even claim to be bankrupt when the BBMP has not even had an internal audit since the past 8 years? BBMP is accountable to each of us and needs to disclose and explain at predetermined regular intervals how it manages our funds” he added. Members of NBF and CAF are determined to fight for better governance. They strongly believe good governance will only be achieved through public participation in the governance. “For real good governance to be possible, top priority must be given for citizen participation in the decision making process at both the planning and implementation stage,” N S Mukunda added. Following the constant demand for citizens’ involvement in the decision making for projects coming up near Koramangala and Sarjapur road, BBMP engineers have started consulting Koramangala Task Force (KTF). “This is one step towards a bigger change,” says Nitin Sheshadri, one of the members of the KTF. 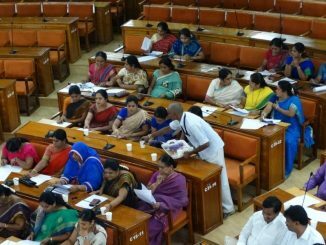 Bangalore Metropolitan Regional Governance (BMRG) bill will ensure transparency in city governance including transparency and audit of government and public lands and contracts. This will also strengthen citizens’ participation in city governance and check corruption. BRACE – NBF demanded that BMRG bill be passed; MPC be strengthened, interests of all MPs, MLAs and Corporators and their families in real estate companies, business and contracts dealing with the BBMP and the state government be disclosed. The residents warned of protests against the exploitation, corruption and bad governance in the city. Namma Bengaluru Foundation announced that it would be happy to fund 50% of any PIL that is aimed to expose illegalities related to city’s development. Check how many BBMP meets your corporator attended in 2014! Council meetings are the most important meetings held two or three days every month, where the corporators sit and decide how the city has to run. Did your corporator attend these meets regularly? Find out. Immigration across state borders is the hot topic now. Why aren’t starkly different opinions voiced by opposing political parties on several other issues. Like for example, Akrama Sakrama. How does one join the CAF. I get no information on searching online. No website, no details. Recently there was a big fanfare announcement about the FOOD bill in the dailies, where it was clearly mentioned that, it was just IMPLEMENTING rules framed during 50s & 60s. So was the rules made only on paper and had not been implemented since then ? Similarly, instead of bringing about AKRAMA-SAKRAMA, let the government implement the rules that are existing and take action according to it on those responsible. It is the RICH circle that BUY law for a price under the table and now trying to get even with it by paying a price OVER the table. AKRAMA-SAKRAMA is a decease that kills the society with POOR ventilation, accessibility, amenities etc., etc. It has to be opposed to the BOTTOM and STRICT action enforced against all those who have ERRED. It appears that the Akrama Sakrama Bill is incomplete in several respects and will only benefit the corrupt. The officials and Builders responsible for violating the rules will escape punishment. Even while the Akrama sakrama bill is being discussed, several new constructions violating the norms are being given Katha. In both old and NewThippasandra , several cross roads and main roads had disappeared with buildings and dead-ends coming up in their place. More than 80% of constructions in Bangalore had 100% violations or more. Hence neither regularisation nor breaking them down is possible without a long drawn legal battle in court. Due to political interference in the past 60 years, most of the Town/City/Metro planning departments in all parts of India, had become dis-functional and violations had become the norm with political involvement. Cities like NewYork, Singapore, kuala Lumpur took up the work of redesigning and reconstructing the entire city, section by section after tearing down the old structure and relaying the new in their place. Unless such bold action leading to total reconstruction work, free of political interference, is possible, no relief from either corruption or violation is possible.